Earth Day is celebrated every year on April 22. It was first celebrated in 1970, and is now remembered in more that 193 countries! When I think of Earth Day, I think of recycling, taking care of the environment and planting food. 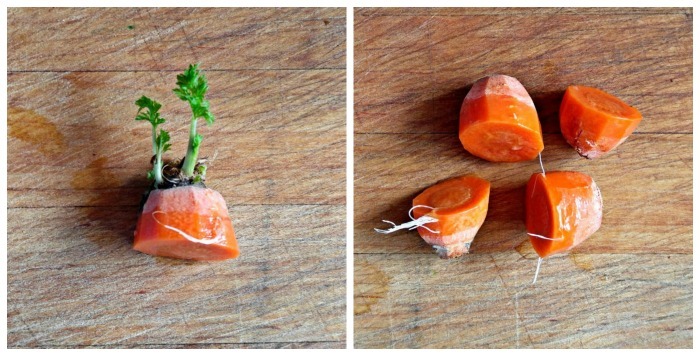 I thought it would be fun to share this project that shows how easy Re-growing Carrot Greens from carrot scraps is. Did you know that April 4 is National Carrot Day? Find out more about the National Days of April in this post. First off, take note. 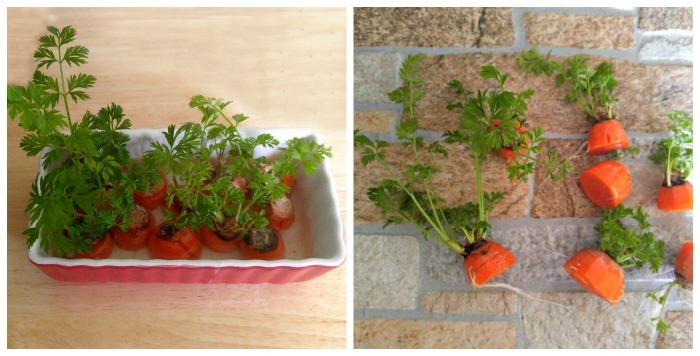 I have seen graphics and posts all over the internet saying that you can re-grow carrots from scraps. You can’t. It’s as simple as that! The root of a carrot is a tap root and once it has been removed from the plant, ti will not re-grow. But carrot GREENS are another story. Carrot greens can be used in the same way that you would use parsley, either as a garnish, or in salads. You can use them to make pesto, add them in home made salsa and give an extra boost of flavor as well as a garnish for carrot soup. They are packed with potassium and other nutrients for health promoting benefits. 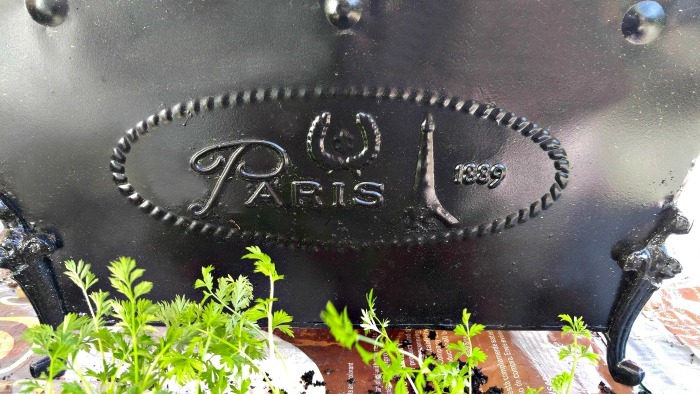 First, let’s recycle this rusty Paris Planter! To make this project REALLY fit right into Earth Day, I will be planting my sprouted carrot tops in a rusty black Paris planter that has definitely seen better days. 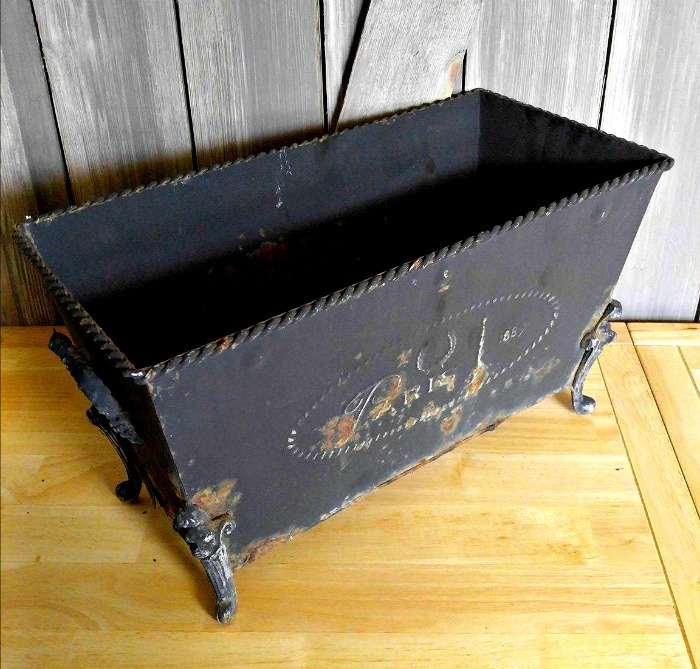 Since this planter belonged to my mother who died just over a year ago, it has a lot of sentimental value to me and I didn’t want to toss it on the scrap heap. The planter had rust just about every where, and it was really just a mess. 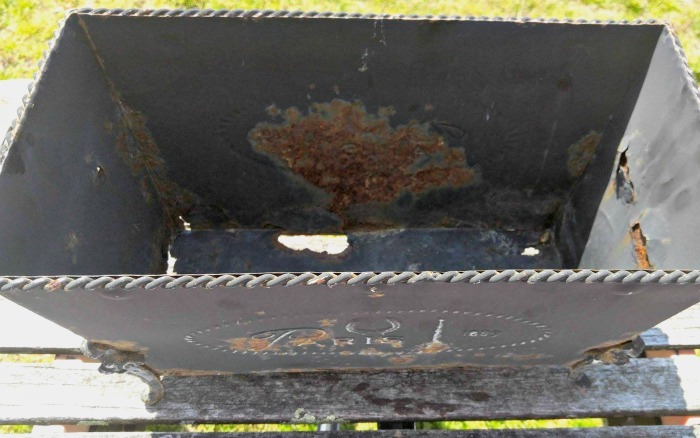 “I can still use that I said to my husband, who just rolled his eyes and laughed.” In my mind, I thought I would just remove a bit of the rust and give it a spray with black paint. The design on the front was still pretty good looking and I was anxious to get started on it. The first thing I did was to scrape away at the rust to see just how bad it really was. After my “TLC” episode, I was rolling my eyes right along with my husband, who now had an “I told you so” look going on. 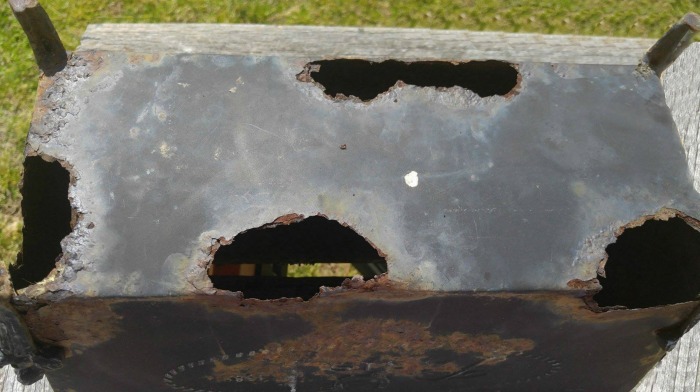 Now, I had a rusty planter with VERY large holes, and 3 legs. One fell off as I was doing my TLC! We cut a piece of plywood the size of the base, so that the soil would stay in the pot. My husband set about re-attaching the leg. Once that was done, everything got a coat of black spray paint. Not too bad, if I do say so myself. Good as new, as long as you don’t look at the bottom, and back of the planter, but that is what walls are for! Time for re-growing carrot greens from scraps. A few weeks ago, I made a chicken and carrots and recipe with baby potatoes in the slow cooker. 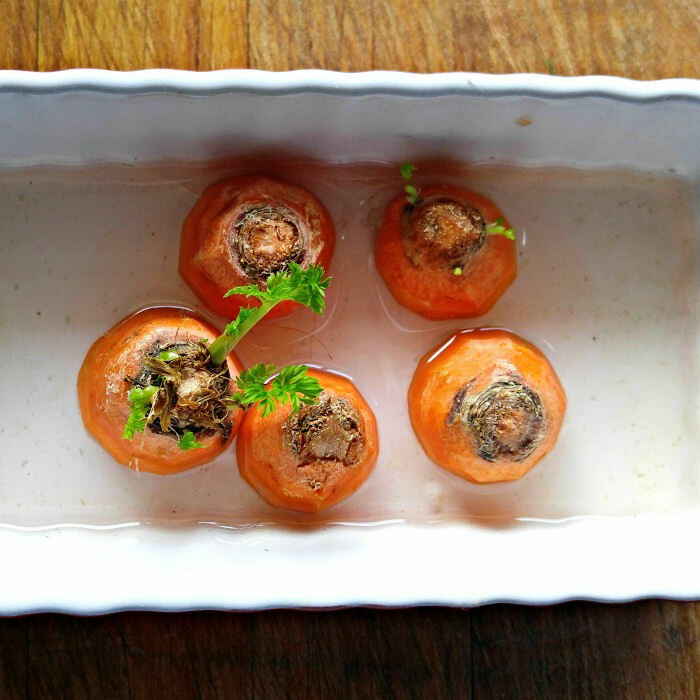 I saved the carrot tops and put them in a dish of water to see if they would root. It didn’t take more than just a couple of days before the carrots started to sprout and grow roots. Now that I knew they would sprout, I kept adding carrot tops to my dish of water. In two weeks, I had this growth and these roots. And after four weeks, I it was time for re-growing carrot greens in my planter! All of my carrots had a bushy top and most had quite long roots, too. I placed my piece of plywood in the bottom of the planter to cover over the rust holes. (I painted it black, too.) I also added some sphagnum moss to cover two holes that extended up the side of the planter, so the soil would not seep out and then I filled my planter with some good quality potting mix. Into the planter went my 7 sprouted carrot tops. Now all I have to do is keep the planter watered and watch the carrot tops grow into lovely ferny looking plants. Who would have ever thought that these carrot tops were started from scraps, and that this lovely planter was a rusty mess when I started? 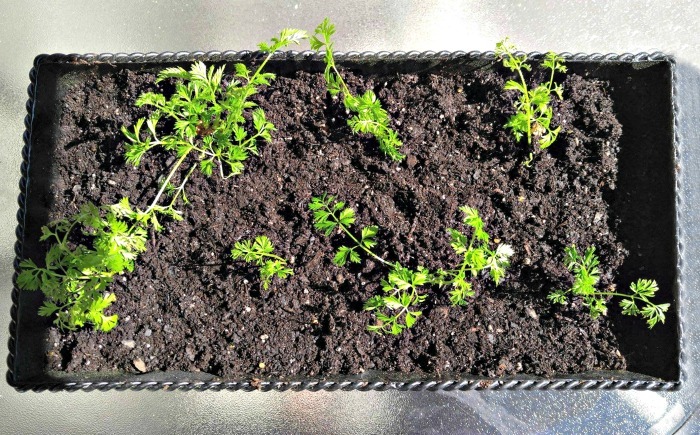 Re-growing carrots from scraps in a recycled, sentimental, planter. What could be a more perfect Earth Day project? I got to keep my mother’s planter for at least one more year. 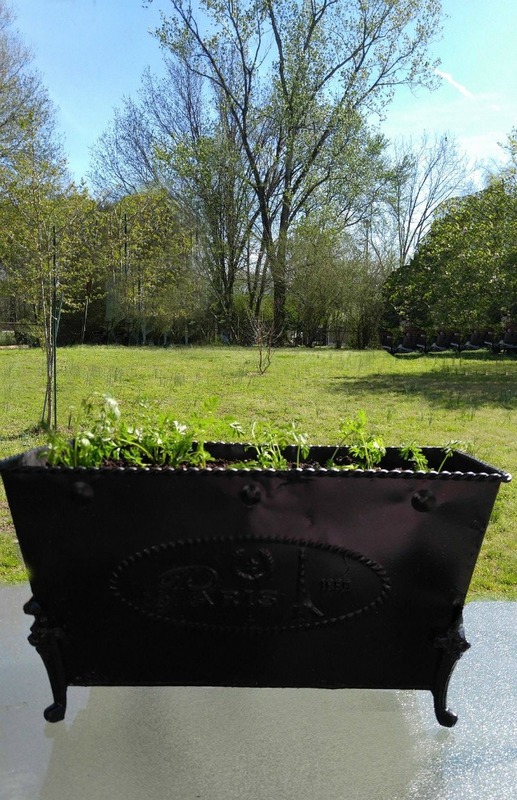 I recycled, I grew some food, and I made sure that the environment didn’t have to deal with a rusty planter. Win – Win all the way around. Go Mother Nature! Have you ever tried re-growing carrot greens? How did it work out for you?